Tiops4&5 is the latest editions of the TIOPS Program Series. The program is designed for cephalometric analysis and intended to aid the clinician in developing individual treatment plans. Tiops4&5 also allows analysis of treatment outcome with dental changes in all three dimensions with occlusogram analysis. The TIOPS program has been developed in collaboration with the late Professor Arne Björk and is in part based on his research findings. Tiops4&5 includes features not found in other similar programs that will facilitate your daily diagnosis and treatment planning. 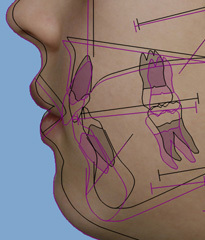 Based on the initial cephalometric morphologic analysis individualized simulations can be developed, for both conventional orthodontic treatment and surgical correction that are a great help in visualizing possible treatment outcomes. The Tiops4 program has now reached its final stage and there are no known program errors at this time, although small improvements will still be made. These updates are available at no charge to all users. According to the EU GDPR 2018, the SAFE version can only be initiated from within a code protected administration program, whereas The CODE version only can be started using a personal code. In the PLAIN version of the program there is no such protection.